Even though it’s the summer, women in Calvary’s job placement program, Step Up DC, are as busy as ever. In late July, Step Up DC was honored to host a table at the Academy of Hope Adult Public Charter School’s Career Fair, and later on, we joined the Far Southeast Family Strengthening Collaborative for their Safe Summer campaign, networking with members of the Congress Heights and Anacostia communities. 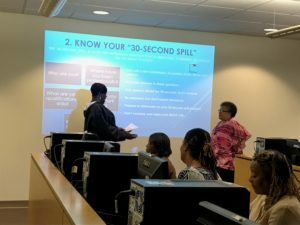 To prepare Step Up DC participants for the real-world job hunt, Calvary also hosted a Women on a Mission training session for women to refresh and practice their skills that they would like to highlight to potential employers. Step Up DC participants have unique qualities and professional experiences that make them ideal candidates for the workforce, so our Women on a Mission training assisted in ensuring those qualities shine. During the training, eight volunteers acted as employers, while Enhanced Resumes, a professional development organization led by Samantha Mitchell, facilitated an engaging class on interviewing. But all of this hard work at training proved to be invaluable, as Calvary’s workforce development program was honored to participate in two prestigious summer career fairs. 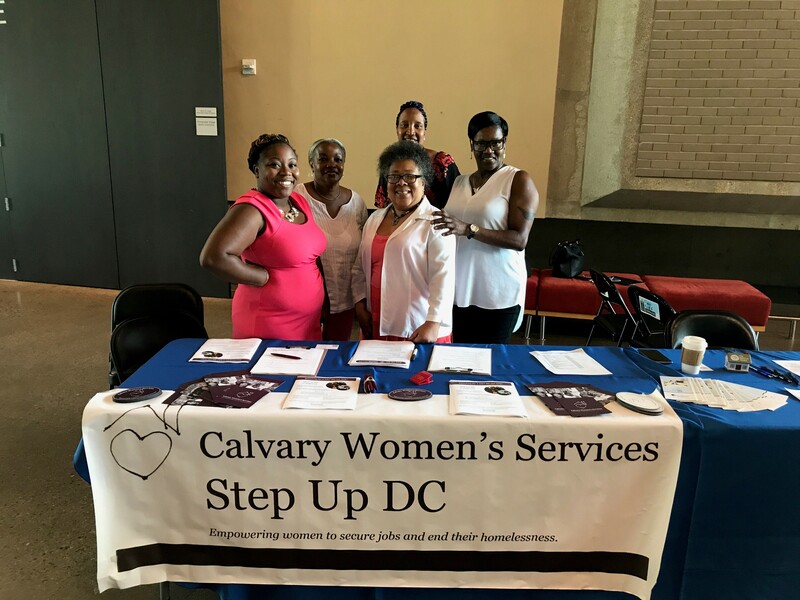 In early August, Step Up DC participants from both Calvary and Skyland traveled together to Congresswoman Eleanor Holmes Norton’s Annual Career Fair at the Convention Center to meet with a wide range of organizations seeking to hire qualified applicants. A couple days later, the group attended the invitation-only D.C. Councilmembers Allen and Silverman’s Wharf Career Fair at Arena Stage. Step Up DC participants were able to reconnect with former employers and introduce themselves to new opportunities. They networked and completed on-the-spot interviews and applications. One participant was overjoyed by her ability to successfully secure a second-step interview with one of the organizations offering security positions at the Wharf. Summer has been a time of great career success for Step Up DC participants – in the last 30 days, 5 participants gained employment in education, administrative assisting, data entry, and security industries, making an average of $13.92 an hour! Step Up DC is on the move. Catch us when you can!